Mills are important to the TPA for two reasons. First, they're important because they are so darned amusing, and second they are important for, as a rule, they identify a ford location and we like to know about fords. Lately we've been spending a good deal of time looking at mill remnants and trying to understand a bit more about the residue of water powered industry in our colonial southeast. Mills amuse in different ways. Molinary technology fans are interested only in the machinery of milling which is, by the way, a fascinating study by itself. Other folks are interested in the rusticity of standing mills, the nostalgic, outer appearance of mills. Yet others are captivated by the hydrology of water powered mills. From the TPA standpoint, though mill and machinery are wonderfully engaging, hydrology is our thing. This derives from the fact that there seems to be a strong correlation between the conditions needed for making a dam and the conditions needed to make a ford. Both dam and ford need an accessible, shallow, solid bottom as foundation. The key really is accessibility. Shallow, solid river bottoms occur anywhere geophysics throws bedrock up into the path of a stream. But, if you can't get a wagonload of corn to it, or get a pack horse to it, it serves little purpose. In fact, the roads sometimes are all that remains recognizable at an old mill site. This weekend we looked at another stream. On old deeds the stream is named "Mill Creek." It empties into the Eno River just upstream from the main bridges leading into Hillsborough from the south. In fact, the creek was probably a ramp used by people and horses to get in and out of the Eno ford before there were bridges. 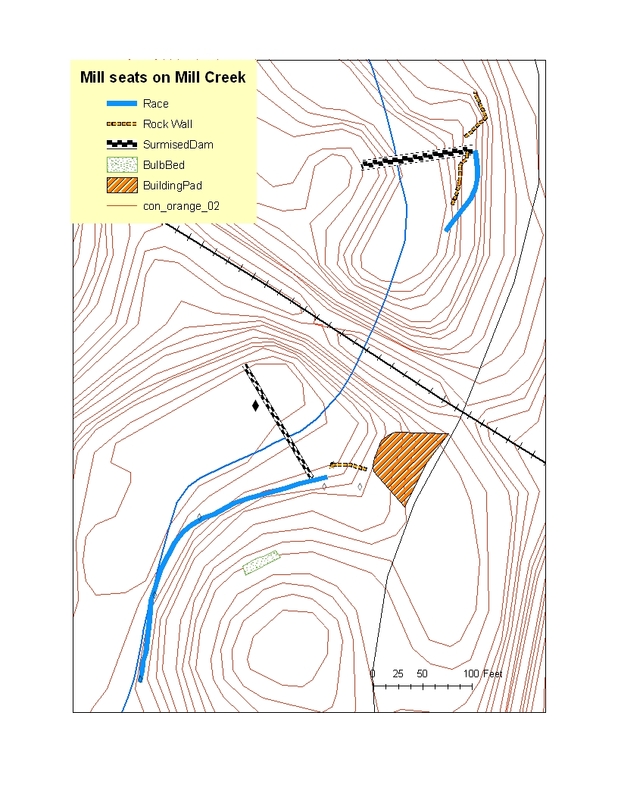 The stream name and a deed map, provided by David Southern (map seen above), showing a mill pond on the stream compelled us to locate the old mill seat. Note that the mill seat is upstream from the railroad. 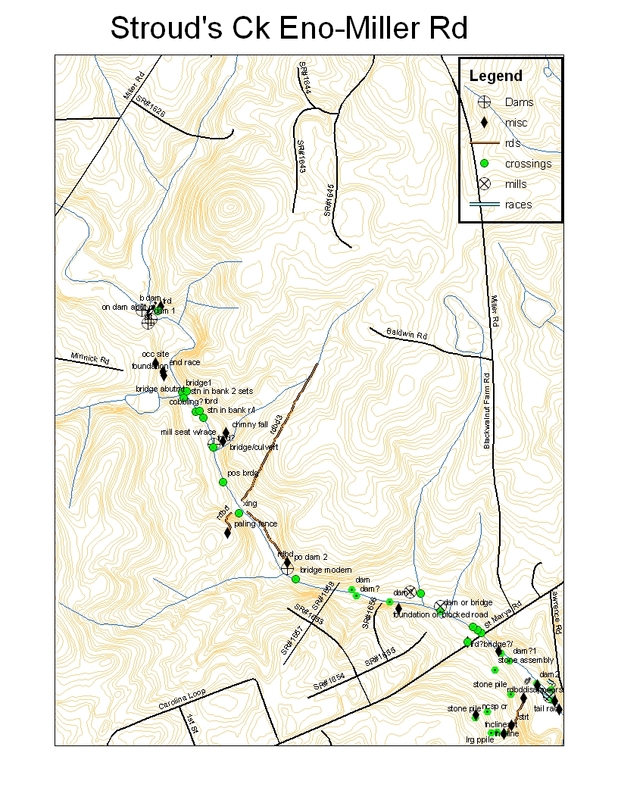 The railroad was built about 1856, so the map content post-dates the railroad. We walked upstream from the stream mouth looking for anomalies. We found our first before we got to the reported mill site. About fifty yards downstream from the railroad grade we found a likely mill seat. Free stacked stone walls and a race cut into the hillside and held up with more free stacked stone confirmed we had found a mill, and the dam remnants, if that is what we saw, indicated a very tall dam once blocked Mill Creek at this site. We found nothing upstream from the railroad but, trusting David's map, we returned the next day to see what could be seen. We found quarried and shaped stone set in the stream bed, and that told us where a dam once rose. Noting nothing of interest on the west bank of the stream, and knowing all recorded roads in the area were located east of the stream, we looked carefully at the slopes above the east bank and we found a race. A bit more searching turned up some other confirming residue, but the site was utterly trashed by sewer construction. Sewer construction along Mill Creek was done quite recently. It was probably done with federal funds, so there should be a Section 106, cultural resource management study done ahead of construction to ensure that nothing of cultural importance will be disturbed by construction. We are looking for that report, now, to see if the CRM/Section 106 report writers took notice of the mill site. As a rule, when a federally funded project is going to impact a cultural artifact, the builders are required to "mitigate" the damage to be done. In the case of archaeological artifacts, the builder will send in an archaeology team to extract whatever information there is in the ground. That is the artifact site is destroyed systematically rather than willy-nilly so we at least retain the information content. We know that was not done on the sites in question. We want to know why not. This is not the first time we have encountered wholesale destruction of cultural information. One memorable case occurred on Twelve Mile Creek in Union County, North Carolina. There a CRM firm archaeologist stepped over not one but three races hewn out of living stone in perfect rectilinear form. We happened on the mill site after the second or third charge had been fired blowing up the rock to make room for a sewer pipe. We stopped the blasting and the pipe line was rerouted. How the heck did the examiner not see the mill races? We asked the owner of the firm but she could not say why but only said that Quality Control was too expensive to do in CRM work, and that the archaeologists put to the task were frequently either unfamiliar with historical archaeological residue or uninterested in same. Alas, this says more about the state of the archaeology profession than most of us want to hear. This cautionary tale is just one more reason why we should find and map as many of these sites as we possibly can as soon as possible. BTW, we found the fords below the mills. Excellent work and good to see you back. 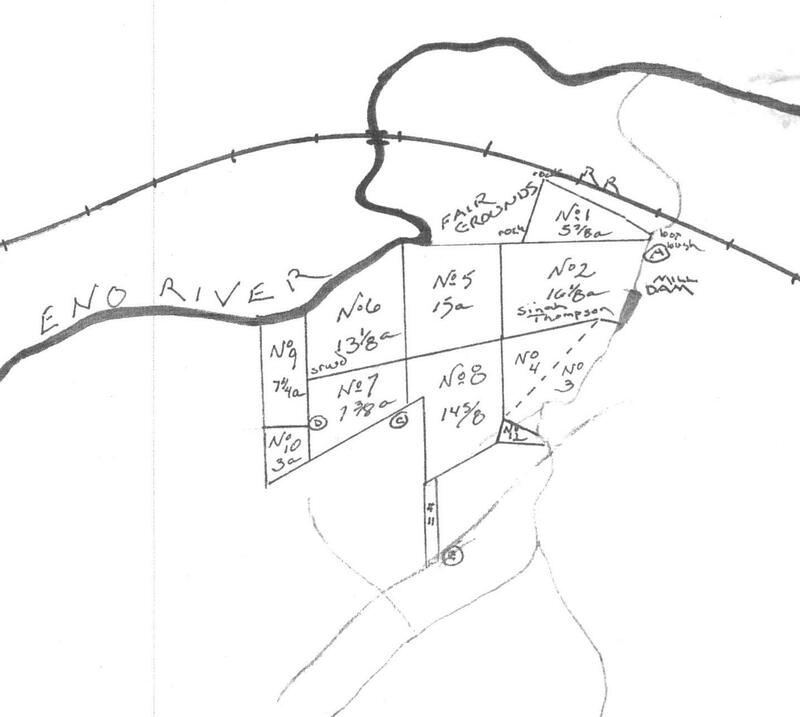 Upon review, I just noted that what in the GIS map I referred to as "mills" (an icon comprised of a circle enclosing a cross) in fact marked likely dam sites, not necessarily mills.